No more than 2 hours drive from Manila, Tagaytay ridge is one of the most picturesque locations in the Philippines. 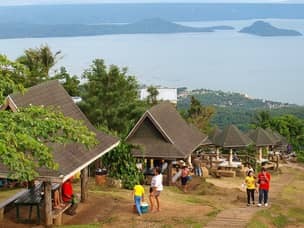 Cool and clean mountain air, an extremely developed tourism industry and most importantly the views overlooking Taal lake, all make Tagaytay the perfect weekend getaway from the city. Our agency provide a wide range of Tagaytay tours and packages. These range from 1 day itineraries to overnight packages. All you have to do is read our guide and add any item you like to your wishlist. Our experts will then contact you, help organize everything into a solid itinerary and make sure you enjoy the best deals and promotions. All our Tagaytay packages include van transfers from Manila. For larger groups, a private bus can be rented. If you wish to make the package cheaper, you are welcome to take the public bus there, just let us know in advance. Since the day tour from Manila leaves early and you’ll only return late at night, we feel it’s better to spend the night in Tagaytay instead. It doesn’t make a huge difference in price, especially if you go for the Tagaytay overnight budget package. All above packages can be modified to suit your specific requests. For longer stays, please contact us directly, or mention it while filling out the inquiry form. Visiting Tagaytay can also be combined into a larger package including other destinations near Manila. These include Laguna, Batangas, Puerto Galera and many more. Tagaytay, and especially the trip to Taal Volcano are a great activity most people would enjoy. It is especially recommended for families and couples. Thanks to being so close to Manila, it can be easily done in a single day and incorporated into most vacation packages we offer. The day tour option can even be combined with a stop at Laguna’s Pagsanjan Falls, letting you get the most of out of a single day tour. Since all tourist spots are close to one another, the exact location of your hotel should not play a key role in your choice. Instead, focus on finding the the best hotel for your budget and expectations. Most hotels and resorts are located near Sky ranch and Picnic grove, with fantastic views overlooking Taal lake. We offer everything from budget accommodation to luxury resorts. All hotels we work with have been carefully selected, after we made sure they meet the highest standards and offer the best deals. Since Tagaytay is a popular destination for local tourists, it’s highly advisable to book in advance. That way, you can get the best hotel deals and promos, and guarantee finding the best hotel to stay at. Most hotels have a swimming pool, as well as a large selection of other amenities and services. They also offer significant discounts for families and large groups – so just contact us to make sure you enjoy these to the fullest. Browse through our collection of recommended hotels, add the one you like the most to your package, and let our agents take care of the rest. Flights : Manila airport is only 45km from Tagaytay, so getting there is very easy. Getting around : Buses will drop you at Olivera Plaza – Tagaytay’s town center. From there, you can take a jeepney or a tricycle to your hotel. Best time to visit : due to the higher altitude, it’s significantly colder and rains are frequent. For the best experience, try and get to Tagaytay during the dry season. The months of June, July and September should generally be avoided. In any case, make sure to bring some warm clothes since temperatures drop at night and it’s quite windy. Attractions : Hiking, 5 star resorts, food, adventure, theme parks and stunning views. Multiple bus companies run the Manila-Tagaytay line, but the best one is San Augustin. Bus schedule change all the time, and unfortunately, they don’t have a website you check in. We suggest you just contact us and we’ll take care of it for you. You can also rent a van or an airport taxi for the trip, which will cost you between 3 and 4 thousand per direction. It’s also possible to reach Tagaytay from Batangas which lies directly to the south. There are buses from all major cities – Nasugbu, Lian, Lipa, San Juan, Taal and of course Batangas City itself. If you are staying at one of the towns near Taal lake, taking a jeepney might be easier. Visiting Tagaytay and Taal volcano can easily be done as a day tour during your Batangas vacation. What to do in Tagaytay? Tourists usually visit Tagaytay mainly for the trip to Taal volcano, but that doesn’t mean there isn’t a lot of other great attractions. The Taal tour can be done in half a day, which leaves you enough time to enjoy everything else Tagaytay has to offer. Continue reading below to find all the major tourist spots and attractions in Tagaytay. Add any of these to your wishlist and our agents will help build a suitable itinerary. Each tour can be booked separately as well, but booking a package would result in a significant discount. Visiting Taal Volcano and swimming in the crater lake are by far the most popular activities. 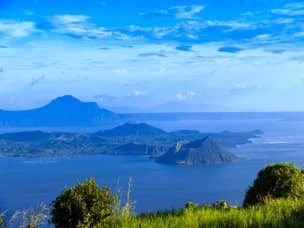 The volcano lies in the middle of Taal lake, and takes approximately 30 minutes to reach by boat. Many agents roam the streets of Tagaytay and try to sell this tour, but booking it on the spot isn’t the best idea. These vendors are trustworthy and will bring you there safely, but you’ll pay more and possibly have to wait as they try and gather more clients. Instead, you should book the tour through the resort or arrange it yourself. Of course, booking it through us as part of a package would mean you get the best deals and we take care of everything. No matter how you plan your trip, it shouldn’t take more than half a day to complete. You’ll have plenty of time to enjoy views and the volcano itself. There are two ways of reaching Taal volcano. The first, and more popular option, is the regular tour departing from Tagaytay. After the standard boat ride you’ll have another 30 minutes hike to the top of mouth of the crater. As you ascend you are greeted by a stunning views of the whole area, and once you reach the top it gets even better. From there, you’ll get the best view of the crater lake which will surly leave you breathless. This standard option however, doesn’t allow for swimming in the crater lake. The trail ends at a steep cliff, so descending is too dangerous. If you are feeling more adventurous, take the hidden trail called Calauit. The tour takes twice as long to complete (5 hours roughly), and the hike is more challenging. The reward is worth it however, as you’ll get a chance to swim in the sulfuric waters which is a really nice experience. The waters are perfectly safe, and you can even pay one of the fisherman for a fish to eat! they’ll be happy to grill it on the spot for you. Since this tour takes longer, and a tour guide is required, the price rises accordingly. Both treks can be done on horseback as well, if you don’t feel like walking in the sun. This option is especially recommended for those taking the regular trail, since there’s no refreshing swim at the end of it. Camping at the crater lake is also very possible, and could be a really fun adventure. If you are considering doing so, speak to us first so we can help you prepare everything you’ll need. These sites and attractions are geared more towards the local crowd, So you might find them a bit underwhelming. Still, they can provide a nice option for filling up your day in Tagaytay, and are all nice activities for families and couples. So, we’ll provide a short description for each, and if something seems appealing you can always contact us for more information. Apart from visiting Taal volcano, going to People’s park in the sky would be our most recommend tour. It’s a relatively short drive uphill, so you can just take the jeepney from the town center. Originally named “The palace in the sky” and destined to become a lavish mansion, the site was later transformed into a public park. Once there, you’ll get a great vantage point from which you can view the whole Tagaytay area. The park isn’t much, with only a few old buildings and not real activities to try. There are a few shops there, where you can buy souvenirs, snacks and drinks. Climb the stairs to the small church’s roof, to get an even clearer viewpoint of your surroundings. A popular family attraction is visiting Picnic Grove, another hillside location with great views. As the name suggests, this is a large grassy area where people gather for picnic and BBQs. There are also some activities offered on site, such as horseback riding, a zip-line and a cable car. Although none of these are too exciting, the place offers a pretty decent adventure package, which is also child friendly. The Sky ranch is another activity which could be fun for families. This is a theme park and amusement center, with plenty of rides and activities you can try. If you are a kid at heart, this is also a nice location for couples. There’s definitely a romantic feeling riding the big Ferris wheel and marvel at the panoramic view. Since the theme park is close to most hotels, it shouldn’t be hard to find time for it if you plan on spending the night in Tagaytay. Nightlife in Tagaytay is quite weak, so your best bet might be visiting the local casino. Although not as spectacular as its Manila counterparts, it can still offer some entertainment and a way to pass the time. As evident by the level of hotels, Tagaytay is a place which attracts wealthy locals. Thanks to that, there are also quite a few good restaurants to try. This could be your chance to try fine cuisine for cheap, and get a taste of the local food – just drop us a mail and we’ll be happy to give a list of restaurants you can choose from. How Does Tagaytay Fit Into My Travel Plan? Limited time offer : Rates as low as 3000p per person! Thanks to being so close to Manila, it’s extremely easy to pay Tagaytay a visit. There should be no problem squeezing it in, either at the beginning or the end of your vacation. We offer Tagaytay day tours going out of both Manila and Batangas, as well as packages which include an overnight stay. Its possible to book these tours by themselves, we’ll still help you take care of everything. However, it’s much better to visit Tagaytay as part of a larger itinerary, so you can enjoy better deals and make the most out of your time in the Philippines. Tagaytay is extremely close to other fantastic destinations such as the beaches of Batangas and Puerto Galera – so why not combine everything and build a more comprehensive plan? Get in touch with us now and we promise to help plan your Tagaytay package and customize it to your specific needs. We promise to stay with you throughout your entire holiday, and make sure you get to enjoy it with a clear mind. Thank you for your interest, one of our agents has already sent you an email. He’ll help you plan your whole day in Tagaytay, as well as offer some more possible day tours from Manila. Hello good day, I just want to know how much the packages from tagaytay we are 5 person thank you.. Just send me a message to my email. I hope that you will response to my message. Packages price depends on whether you’d like to visit Tagaytay as a day tour from Manila, or stay there for a night or even more. Of course, the level of the hotel you choose always effects the price. We will mail you all details shortly. Thank you so much for showing interest in our services. 1. 1 night hotel accommodation with 1 day tour. Target date is on December 9-10, 2017. The price for the overnight package naturally depends on the hotel you choose. For both options, group discounts are also available so that might help cut costs as well. In any case, a mail has already been sent to you by one of our agents. Thank you very much for your interest in our services – we’ll do our best to help you build the perfect trip! Hi Paolo and thank you for the inquiry! We can’t really give you a price without knowing what level of accommodation you expect. For your dates, hotel prices range between 2000P a night (3 star) and 5000 for 5 star hotels. We’ll email you soon so you can give us some more detailed information, then we’ll be happy to help you plan your trip. We’re interested in a Tagaytay-Taal Volcano round-trip day tour from Makati hotel. How much would a day trip cost for 2, maybe 4 people? Day Trip date would be Jan 20. I sent you a mail with an offer. Generally speaking, These tours cost between 90 and 100$ pp, depending on the size of your group as well as availability on said dates. This includes hotel pickup and dropoff (private van) as well as a lunch buffet in Tagaytay. Sure! we will mail you an offer for both options. Could you please quote tour to tagaytay 3 adults + 13 years , Family room 1 night. Departure from Makati. 12th January or 13rd. Since this is a bit of a late notice, would you consider visiting Tagaytay as a day tour from Manila instead? We’ll check availability for hotels and get back to you ASAP. We are interested in taking the Tagaytay-Taal Volcano tour for 4 people. Would you please send me a quote? Where in Tagaytay is the start point of the tour? Thank you for your inquiry, one of our agents will mail you later today with an offer. Normally our tours start either at Manila, or we pickup the guests from their hotel in Tagaytay. If you want to skip the pickup and just get there independently, We’ll update you on exact location and starting time – it’s based on other participants. Sure, no problem! we’ll mail you an offer later today. Will send, thank you for your inquiry! Hello! Can you help me plan for a one day tour in tagaytay. We’re 2 people. Could you please fill out the inquiry form here? We need more information before we can give a quote. How much does a day trip to Tagaytay (from Quezon City) usually cost? 3 adults and one 12-year old will be traveling. The price is roughly 2000 PHP per person (40 USD). This includes hotel pickup/ drop off, free lunch buffet, and a guided tour of Taal volcano and Tagaytay ridge. However, this really depends on your travel dates and availability. The best thing would be to contact us directly through this page and we will send you an exact quote. The usual price for this tour is 2100 Pesos, then you have an extra 500p charge for pickup from Quezon. It makes no difference if you choose to return with the van or not, since we send him there anyway and he has to return to Manila. Yes, of course. Only the additional 500p charge will be divided between the 3 of you. Hi Marissa and thanks for the comment. Can you please fill out the contact form and give us your phone number? We need more information before we can process this request, namely your phone number. Good afternoon, I submitted my contact form requesting an overnight tour from Manila to Tagaytay including transfer, hotel and guide from tomorrow, Friday, 16 March to Saturday, 17 March. Please respond ASAP. We hope you had a great time on your trip, we were very happy to help! Hello po, I would like to have a quote for Taal Volcano day tour (package tour) for 14 pax. Including the boat ride and any entrance fees po. Excluding na po ang van/land transfers considering na nasa tagaytay na po kami. Date would be on December 23, 2018. Thank you po. Since you’ll be in Tagaytay already honestly there’s not much point in booking through us. Our service is more for foreigners who can’t speak Tagalog or just don’t want to deal with the vendors. Or for people who are looking for a complete package along with accommodation and transportation from Manila. Can the pick up location be at a BGC hotel? We mailed you an offer for this request – if you can’t see it please check your spam box. hi. i would like to inquire about an overnight tour in tagaytay for 4 adults on september 27 and we’ll need to be back in manila for our flight to davao at 5pm…. Hi Jebby and thanks for leaving a comment. It would be much better if you could take the time to fill our short inquiry form. That way we have all the relevant information and can plan the optimal trip for you.